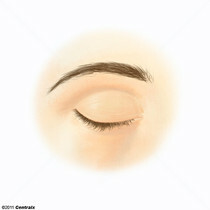 Curved rows of HAIR located on the upper edges of the eye sockets. 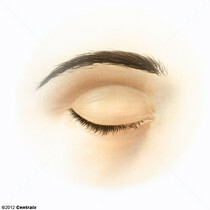 The hairs which project from the edges of the EYELIDS. A tube-like invagination of the EPIDERMIS from which the hair shaft develops and into which SEBACEOUS GLANDS open. The hair follicle is lined by a cellular inner and outer root sheath of epidermal origin and is invested with a fibrous sheath derived from the dermis. 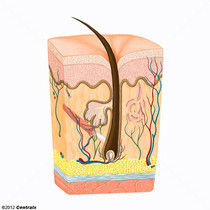 (Stedman, 26th ed) Follicles of very long hairs extend into the subcutaneous layer of tissue under the SKIN. 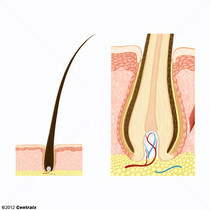 A filament-like structure consisting of a shaft which projects to the surface of the SKIN from a root which is softer than the shaft and lodges in the cavity of a HAIR FOLLICLE. It is found on most surfaces of the body.